Last year I was obsessed with beauty boxes and had so many products to try that I struggled to choose what to use first. It's a year later and I still haven't even used half of them, though my collection has slightly diminished. One of the many boxes I ordered was the British Beauty Blogger Dream Box III and in it was Ole Henriksen's Pure Truth Melting Cleanser. 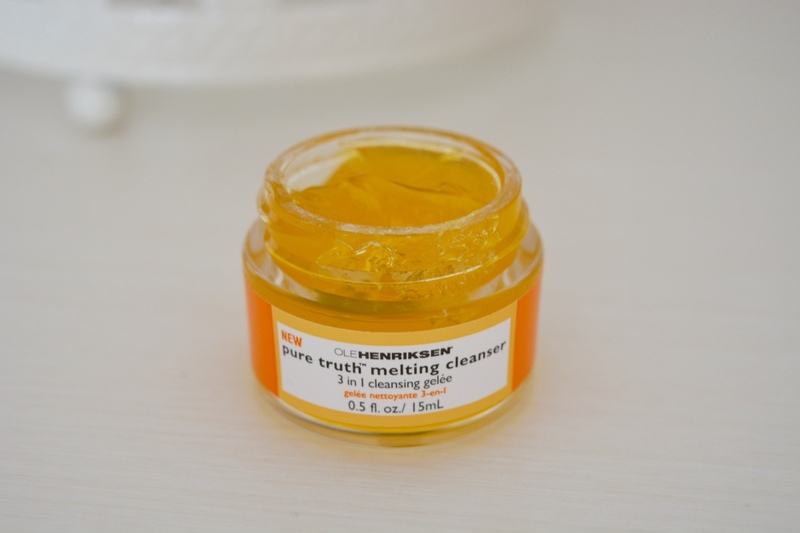 I hadn't tried any Ole Henriksen products so I was interested to put it to the test, especially as the product was a melting cleanser and I definitely hadn't heard of anything like it before. Ole Henriksen Pure Truth Melting Cleanser is a threefold cleanser, which starts as a thick gel that dissolves into a soothing oil once touched and then into a hydrating milk once rubbed it into your skin. Simply wash off the cleanser with water, which lathers the milk and rinses skin clean. It easily cleanses skin of any impurities and makeup that just won't budge, giving skin a fresh and brighter complexion. I have recently become obsessed with knowing what ingredients are in my skincare products to ensure my skin is getting the best ingredients possible and to know what other products to use alongside it. The Pure Truth Melting Cleanser is rich in Vitamin C, Rose Hip and Virgin Cherry Oils, which brightens, repairs and nourishes skin. My skin feels softer and more luminous since using the cleanser, it has also reduced redness and my skin feels slightly tighter. The full size product costs £24, which is more than your average cleanser but it honestly does work and is different to facial products I have tried in the past. Have you tried any Ole Henriksen products in the past? If you have I'm curious to know which ones, as I don't know what to try next.